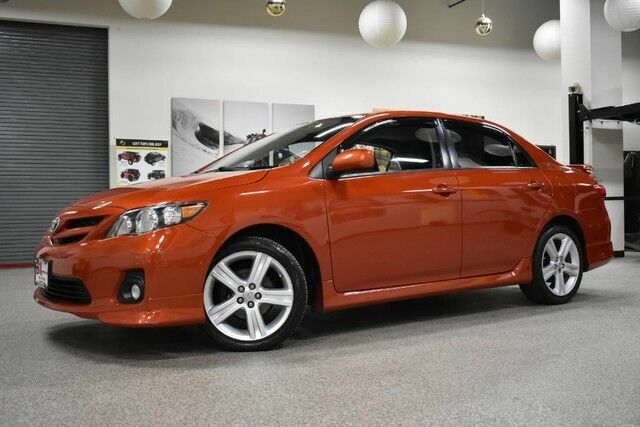 2013 Toyota Corolla S Special Edition only has 49,222mi on it and could potentially be the vehicle of your dreams! This is a very clean and well taken care of vehicle, it has been traded to us by the owner that loved this car, it comes with Navigation and Sunroof, one of the nicest ones you will find. Please look at all the pictures, to see how nice this vehicle really is. This Toyota includes: HOT LAVA DARK CHARCOAL W/ORANGE ACCENTS, FABRIC SEAT TRIM Cloth Seats FLOOR MATS ALUMINUM WHEELS POWER MIRRORS POWER WINDOWS BLUETOOTH SUNROOF NAVIGATION SYSTEM *Note - For third party subscriptions or services, please contact the dealer for more information. * This vehicle is loaded with great features, plus it comes with the CARFAX BuyBack Guarantee. The impressive Toyota fuel-efficiency will make you quickly realize what you've been missing out on in life. It's noteworthy fuel economy and minimal emissions make this vehicle's value a cut above the rest.